Burgers, fries and soft drinks are a hallmark of fast food establishments. But, this trio proves they don’t have to be greasy, filled with cheap ingredients and loaded with sugar. Yup, that goes for the fizzy drink as well. And I can find all the ingredients at my local greengrocer’s, just a short stroll up the road. Indeed, burgers, chippies and soft drinks don’t have to be all junky. 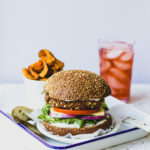 I’ve written about alternatives to sugary drinks previously if you are after some more inspiration, but today I thought I’d share a burger and chips combo you might like to try that comes with its own healthy drink and despite using a few organic ingredients, can be achieved on a small budget as well! Best of all, I can find all the ingredients at my local green grocer’s just up the road which means I can tick exercise off my to do list before dinner, too. I must say I’m at my local grocer’s at least once a day. You see, I am not one for making lists or menu plan as such so I quite often have to duck out to get this or that, that I have forgotten to pick up or that’s essential to making the evening’s dinner! I’m not sure what the staff think of my frequent appearances, though they always remain friendly and helpful. More than, even. I’m always ordering edible flowers or special ingredients. In fact, when I was shooting a radish spread for a Polish magazine Kuchnia, I had my local Harris Farm Market supply a range of beautiful radishes for me. They always come through with the goods! And so, for the healthied-up burgers and chips… I like burgers. 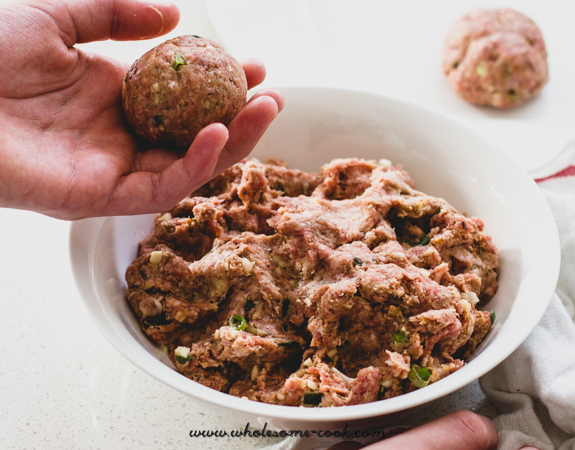 I think they can be quite nourishing, in fact, and a perfect meal to make with your kidlets at home, because cooking together and choosing better ingredients will not only teach them essential skills for life, but it’s a great conversation starter. I made the patties using grass-fed organic beef which can be purchased from most places nowadays – but my local store at Boronia Park has a great variety – from certified organic grass-fed beef mince from Belmore Meats, through grass-fed Cape Grim and a bit more budget-friendly Tara Valley mince varieties as well. Grass-fed meat is higher in the anti-inflammatory Omega-3 and lower in Omega-6 than factory farmed meat. The great thing is that there’s often quality organic beef mince discounted when it’s close to its “use by” date so that even if you are on a budget you can treat yourself to quality meat at the price of the regular stuff. And you will be casting a very important vote with your shopping dollars. For a fabulous flavour in the patty itself, add as many of the spice mix ingredients as you have on hand – this way you will avoid additives that lurk around in pre-made spice mixes as well. As for the mayonnaise, organic or homemade are best and pickles, for best probiotic benefit, should be fermented using a water and salt brine instead of a vinegar and sugar mix. 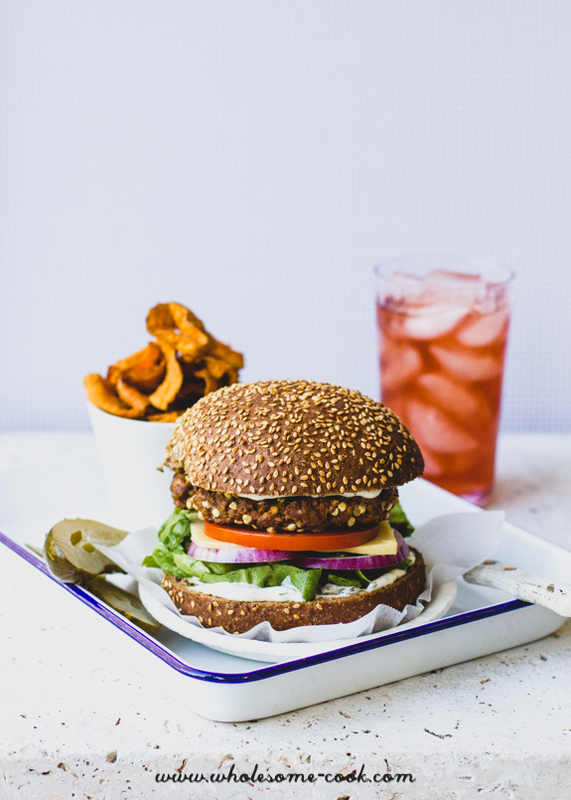 For an added wholesome food tick, pad the burgers out with a range of fresh veg to boost their nutrient content – fresh tomato, cos lettuce, onion, smashed avocado and sliced beets are just a few ideas of delicious toppings. 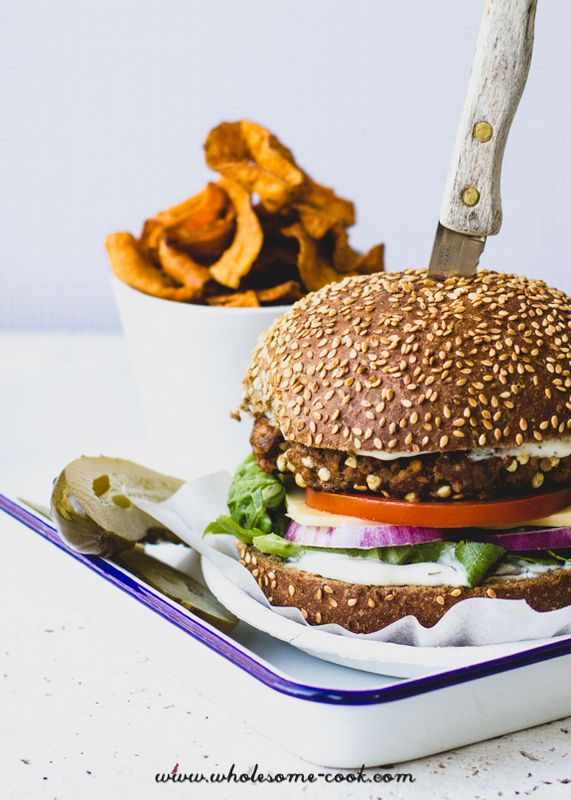 Healthy it up further by using organic seeded sourdough bread or rolls for a more wholesome alternative to regular hamburger buns, and if bread is totally not your thing, use a couple of sturdy cos or iceberg lettuce leaves to serve your burger in. That’s how I prefer to have mine anyway. Serve with a side of sweet potato crisps – a little indulgent I know, and if you prefer Harris Farm also stock the Boulder Canyon brand of coconut or olive oil cooked chips! Now, that’s pretty cool. For a healthier fizzy drink substitute, try some kombucha for that ultimate fast food to whole food makeover. Like with most other fermented foods, because of the live good bacteria in the drink, the rule here is to start slow, so either go with a 1 cup serving to start with or dilute it with water if you are going to have more than a glass. 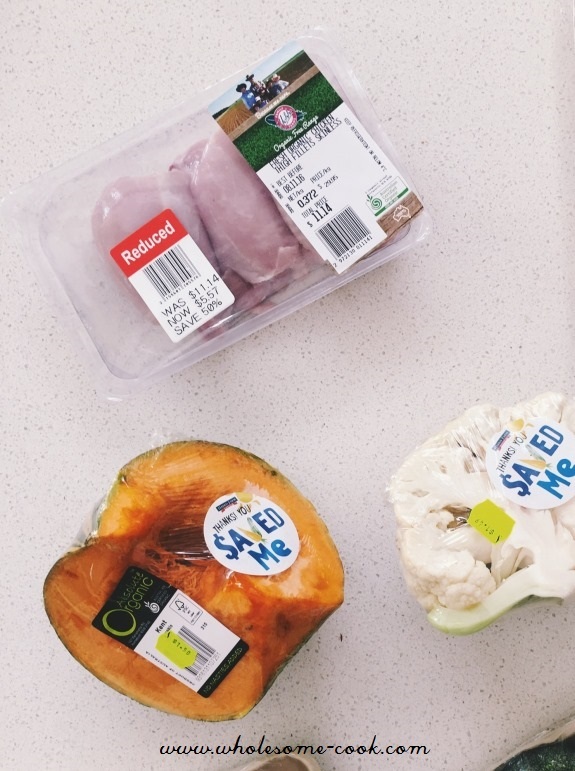 I absolutely love what Harris Farm Markets are doing as well in terms of supporting farmers by stocking the #ImperfectPicks range of fruit and veg which is cheaper than regular stuff, and the assortment available is growing! You can save fruit and veg from going to the heap in the bargain corner, my absolute favourite place to rummage around. It feels so good knowing you’re helping the store reduce food waste. And if it isn’t sold? Well, the good folks at OzHarvest pick up leftover produce and deliver it to local soup kitchens to feed the needy! It’s such a great initiative and it makes me so happy to be a HFM shopper. Now, I know what some of you might be thinking – I wish I had a green grocer like that in my local area! I challenge you to go out and chat to your grocer about some of the initiatives mentioned above. Show them you are interested in reducing food waste and perhaps helping those on a budget to get a greater variety of fruit and veg in their diet, right from the bargain corner. Tell them what products you would like to see more of, or make special orders. They will be happy to help! For a fabulous flavour in the patty itself, add as many of the spice mix ingredients as you have on hand – this way you will avoid additives that lurk around in pre-made spice and packet mixes. You can use raw or activated buckwheat groats in this recipe. As for the mayonnaise, organic or homemade are best and pickles, for best probiotic benefit, should be fermented using a water and salt solution instead of a vinegar and sugar mix. You can cook these on a barbecue and skip the frying part. Rinse buckwheat, transfer to a small saucepan and fill with enough water to cover. Bring to the boil over medium heat, then cover and cook on low heat for 5-8 minutes or until the groats are soft. Drain, spread in the sieve and allow to cool for 10 minutes. Once the buckwheat has cooled enough to handle, transfer it to a bowl and add mince, spring onion and spice mix. Using your hands ‘knead’ well for 3-4 minutes to help the meat bind. Form 4 evenly-sized patties, about 1cm thick. Heat oil in a large pan set over medium high heat and add the patties. Cook for 2-3 minutes then flip and cook for a further 3-4 minutes. Your grocer sounds amazing! More stores should help out with feeding the needy – we have an oversupply of food worldwide yet so many people go hungry! even in our own country. Well done to Harris Farm for doing something about it. 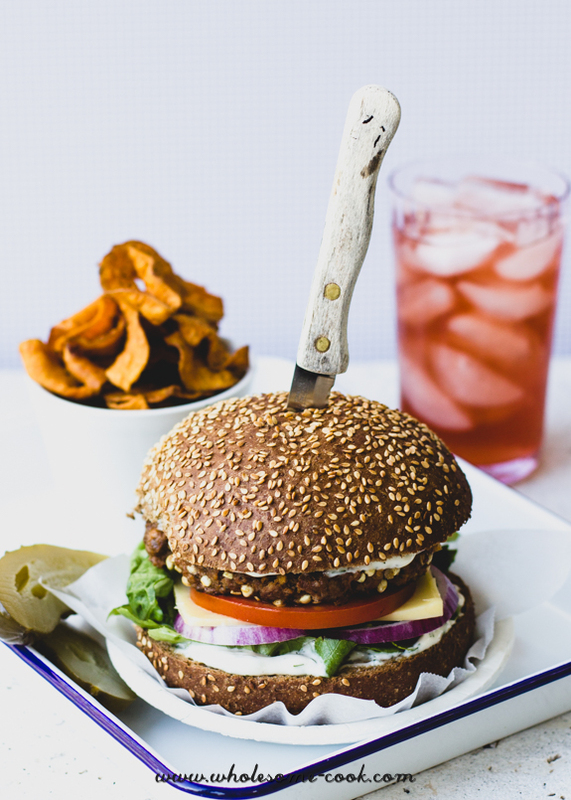 I love the idea of adding buckwheat to the burgers and in general I agree that burgers can be made healthily. Thanks for sharing the tips.